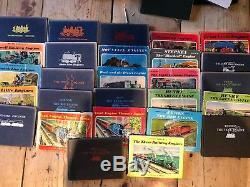 Rev W Awdry "Railway Series" books (Thomas the Tank Engine). These are all in used condition and have been well read! I've noted where there are issues and aside from this all books are fully intact, none of the pages are creased/torn, there are no pen/pencil markings etc. A mix of hard cover and soft cover. No 1: The Three Railway Engines - hard picture cover (1972) ISBN 0 7182 0000 4 - in really good condition. No 2: Thomas the Tank Engine - hard cloth cover with red writing/image (1970) ISBN 0 7182 0001 2 - in really good condition. No 2: Thomas the Tank Engine - hard cloth cover with white writing/image (1967) - generally good condition except for red felt tip scribbles on foreword page. No 3: James the Red Engine - hard picture cover (1973) ISBN 0 7182 0002 0 - in really good condition except minor tear on binding. No 4: Tank Engine Thomas Again - soft cover (1986) ISBN 0 434 92765 1 - in really good condition. No 4: Tank Engine Thomas Again - soft cover???? ISBN 0 7182 0413 1 front and back covers creased, first page loose. No 5: Troublesome Engines - hard cloth cover with silver writing/image (1967) cover in good condition, some pages loose. No 6: Henry the Green Engine - soft cover (1985) ISBN 0 7182 1058 1 - in good condition, front and back covers creased. No 6: Henry the Green Engine - soft cover (1971) ISBN 0 7182 0421 2 - in good condition, front cover creased. No 7: Toby the Tram Engine - hard cloth cover with blue writing image (1970) ISBN 0 7182 0006 3 - in really good condition. No 8: Gordon the Big Engine - hard cloth cover with blue/green writing/image (1970) ISBN 0 7182 0007 1 - in really good condition. No 10: Four Little Engines - soft cover (1974) ISBN 0 7182 0415 8 - in really good condition, minor creases on back cover. No 11: Percy the Small Engine - hard cloth cover with green writing/image (1970) ISBN 0 7182 0010 1 - in really good condition. No 12: The Eight Famous Engines - soft cover (1971) ISBN 0 7182 0422 0 - in good condition - front cover creased. No 13: Duck and the Diesel Engine - soft cover (1975) ISBN 0 7182 0437 9 - in good condition front and back covers creased. No 15: The Twin Engines - hard cloth cover with orange writing/image (1969 - 2nd edition) in really good condition tear to cover on spine. No 16: Branch Line Engines - soft cover (1973) ISBN 0 7182 0431 X - in good condition - front cover creased. No 17: Gallant Old Engine - hard cloth cover with silver writing/image (1970) ISBN 0 7182 0016 0 - in really good condition. No 18: Stepney the Bluebell Engine - soft cover (1975) ISBN 0 7182 0423 9 - in good condition - two loose pages. No 19: Mountain Engines - soft cover (1972) ISBN 0 7182 0427 1 - in good condition - tear to first page, front cover creased. No 21: Main Line Engines - hard cloth cover with silver writing/image (1971) ISBN 0 7182 0020 9 - in really good condition. No 22: Small Railway Engines - soft cover (1972) ISBN 0 7182 0426 3 - in really good condition. No 23: Enterprising Engines - hard cloth cover with yellow writing/image (1968 - 1st edition) ISBN 07182 0022 5 - in really good condition. No 24: Oliver the Western Engine - hard cloth cover with orange writing/image (1969 - 1st edition) ISBN 07182 0028 4 - in really good condition. No 25: Duke the Lost Engine - hard cloth cover with red writing/image (1970 - 1st edition) ISBN 0 7182 0840 4 - in really good condition. No 26: Tramway Engines - hard picture cover (1972 - 1st edition) ISBN 0 7182 0842 0 - in really good condition. No 29: Great Little Engines (by Christopher Awdry) (1985 - Ist edition) ISBN 0 434 92806 2 - in really good condition. Any questions, please get in touch. The item "Thomas the Tank Engine Rev W Awdry Railway Series 27 Books" is in sale since Monday, January 01, 2018. This item is in the category "Books, Comics & Magazines\Children's & Young Adults\Non-Fiction\Pre-School & Early Learning". The seller is "simonezbarberanimus" and is located in Canterbury. This item can be shipped to United Kingdom, Antigua and barbuda, Austria, Belgium, Bulgaria, Croatia, Cyprus, Czech republic, Denmark, Estonia, Finland, France, Germany, Greece, Hungary, Ireland, Italy, Latvia, Lithuania, Luxembourg, Malta, Netherlands, Poland, Portugal, Romania, Slovakia, Slovenia, Spain, Sweden, Australia, United States, Russian federation, Canada, Brazil, Japan, New Zealand, China, Israel, Hong Kong, Norway, Indonesia, Malaysia, Mexico, Singapore, South Korea, Switzerland, Taiwan, Thailand, Bangladesh, Belize, Bermuda, Bolivia, Barbados, Brunei darussalam, Cayman islands, Dominica, Ecuador, Egypt, Guernsey, Gibraltar, Guadeloupe, Grenada, French guiana, Iceland, Jersey, Jordan, Cambodia, Saint kitts and nevis, Saint lucia, Liechtenstein, Sri lanka, Macao, Monaco, Maldives, Montserrat, Martinique, Nicaragua, Oman, Pakistan, Paraguay, Reunion, Turks and caicos islands, Aruba, Saudi arabia, South africa, United arab emirates, Ukraine, Chile.